I'm often asked, "How do you get your eggs so yellow?" It's really quite simple. If you follow these instructions, you can also learn how to peel your eggs easily. 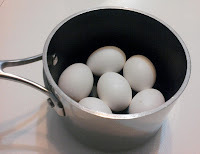 1) Start by using a heavy saucepan which will fit as many eggs as you need on the bottom (without having to place any on top -- this is how they often crack during boiling). 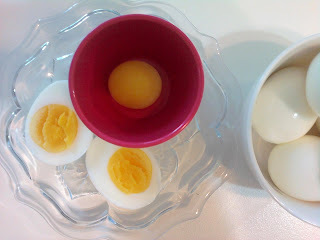 2) Fill tap water to about an inch over your eggs. 3) Place on stove and turn to high. 4) As soon as your eggs begin a real 'rumbling' boil, time the boiling for 3 minutes then remove completely from heat and leave uncovered. 5). Let your eggs sit in this hot water for approximately 20-25 minutes. After this point they will be ready to peel. To peel eggs, remove half of this hot water and replace with cold to make it easy to dip your hand in to pick up your eggs. Now, simply reach in your warm water and take each egg and give it a firm crack onto the bottom of the pan (cracking at the bottom part of the egg is best). Let the eggs continue to sit in the warm water for a few more seconds, and then take the first one out and start peeling it -- taking the membrane with it as you go. Dip it into the warm water if it become a bit stubborn. And there you have it!